We offer quality excavators with experienced and fully qualified operators. 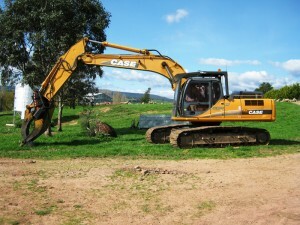 We have earned a reputation as the most reliable excavator hire service in Mansfield and have decades of experience working in Mansfield Shire and the surrounding areas in north east Victoria; From Wangaratta and Benalla down to Alexandra and Yea. Specialising in ‘wet hire’ which means that we provide operators for all of our equipment.The advantage of this is that you don’t need to know how to use the diggers, you just need to know what you need done. All of our operators are fully qualified and know the equipment inside out and have decades of experience working on a wide range of jobs. Our excavators come equipped with a variety of tools including angle tilt bucket, hammer, sorting bucket & a dig bucket to suit the applications you require. We also have a log grab & saw attachment for tree removal on a grand scale. Apart from offering the best excavator hire, we also offer a full range of earthmoving equipment; grader, bulldozer, backhoe, loader tipper trucks and trailers.You can’t go past Mansfield Plant Hire when it comes to digger hire and plant equipment hire, Our range of earthmoving machinery is perfect for your next job. Our CAT 140H grader makes road construction a breeze. The bulldozer is equipped with a ripper and is essential for Dam construction. The backhoe loader is another versatile machine handy for trenching and excavation jobs, curvert cleaning & landscaping. We supply tip trucks and trailers too, the 28 tonne truck is perfect for having loose materials transported to and from your job site. You’ll also find a huge range of accessories for our machines, so it doesn’t matter whether you need to do ripping, crushing, lifting, cutting, digging or boring – we’ve got the right tools for the job. Give us a call for a quote on 0418 318 456.